Home / Spirituality / In Which Way Does Hinduism Differ From Other Religions? In Which Way Does Hinduism Differ From Other Religions? – Hinduism is the oldest religion on this planet, which is still practiced today. This beautiful and vast religion has millions of followers all over the world. But mostly in India and the surrounding countries. Hinduism has a lot of common aspects with other religions, mostly Buddhism and Sikhism and other of its sects. But it also differs from the other religions of the globe in 4 major aspects. Hinduism doesn’t have a founder – unlike, Buddhism, Christianity, Islam and the other religion, Hinduism doesn’t have a single specific founder. It appeared as a sect or combination of other ancient religions nearly 5 thousands of years ago. Hinduism doesn’t have a specific theological system – this beautiful religion has numerous sects, which all differ in one way or another. Also, the theological practices and systems vary depending on regions and countries. Although it has numerous ancient works with spiritual and religious knowledge. They don’t specify the theological system of Hinduism. Hinduism doesn’t have a single concept of deity – in other words, Hindus believe and worship multiple deities. Although, they consider themselves monotheistic. At the core Hinduism teaches that there is one almighty god which is divided in multiple deities. Hindus worship thousands of deities, all part of their religious beliefs. The 3 most important deities in Hinduism are part of the Triumvirate and they are: Brahma, Shiva and Vishnu. Hinduism doesn’t have a central religious authority – all the other religions of the globe have a specific hierarchy. But Hinduism doesn’t, although they have the castes. But those are a social system, not religious. In Hinduism there is no religious authority. There is a lot of knowledge and spiritual wisdom in the Vedas and Upanishads. But none of these texts contain rules or moral codes, such as the Ten Commandments in Christianity. In conclusion, now you know the answer to In Which Way Does Hinduism Differ From Other Religions? 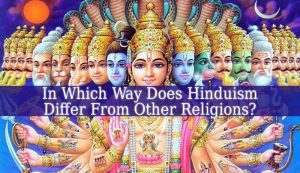 There are 4 major differences, which make Hinduism a special religious philosophy. And, regarding its ability to survive over 4 thousands years, it is incredible. Most of its sacred works were heard and told from generation and generation. Becoming one of the biggest religions of the planet. Previous Does Hinduism Celebrate Christmas?